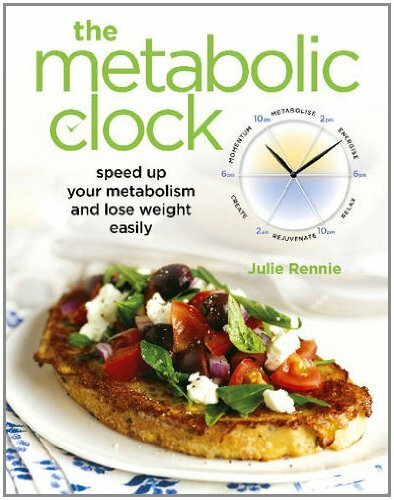 I first stumbled upon the book ‘The Metabolic Clock by Julie Rennie’ on my mum’s bookshelf. While I was over at her house, I couldn’t stop reading it and when I left I took it home. I stole borrowed it. Since then I have read this book over and over again. After we moved mum just gave it to me! It has helped me set some good habits – like not going to bed past 10pm. And it has inspired me to be the healthiest version of myself I can. It teaches you how to speed up you metabolism to help you lose weight based on the metabolic clock. It shows you how to change lifelong patterns that have been preventing you from living life to the full. The gluten free flourless chocolate cake recipe in the back of the book is yum! I use coconut oil instead of butter to make it dairy free too and it turns out great. It has the consistency of a mud cake and it makes a great treat. I’ve made the spicy bean stew many times too and it makes for a hearty filling vegetarian meal. Sometimes I don’t like to eat too much meat and it’s good to have a few vegetarian recipes up my sleeve. The pictures in this book are beautiful – I love inspiring photography and nourishing food photography. It teaches you how to think positively and how a negative view of yourself can impact your health and weight loss. The 21 day lifestyle challenge has helped to go to bed before 10pm. I have struggled in the past with disciplining myself to get to bed at a decent hour. And with babies still waking me in the middle of the night – an early bedtime is essential to my well being and ability to function and think clearly throughout the day. The book briefly mentions yoga and meditation. I choose not to do these things as they are associated with eastern evil religious practices. As a Christian I don’t want any part in stirring up the wrong spirits. All in all – it’s a great read and the best thing is that it inspires me to keep up with my health regime. I’ve been riding my bike weekly and going for at least 3 power walks a week. Plus I’m always looking for ways to improve my diet. *I thought I’d do a review of a few of my favourite books. There’s no affiliate links. I would not overlook meditation so quickly. I believe that the ability to be receptive to God’s plan requires a quietness of the mind, which meditation allows each of us to cultivate. Evil spirits cannot take hold of a person proficient in the art. These views are also shared by Christian monks across the world.